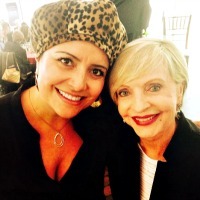 Florence Henderson was the guest speaker at last month’s special Annual Visionary Women Caregiver luncheon hosted by the Alzheimer’s Association of Orange County. The Alzheimer’s Association being the visionaries they are, established an award to honor women dementia caregivers – paid and unpaid as well as professionals and non-professionals. Catalina Elwell and Laura Lara represented Cerna at the City of Hope Health Fair on May, 13, 2015. City of Hope is a leader in the fight to conquer cancer, diabetes, HIV/AIDS and other life-threatening diseases. City of Hope is a new model of cancer center, focused on rapidly transforming scientific discoveries into better treatments and better prevention strategies for diseases. Catalina Elwell donated her time once again to Alzheimer’s disease. She volunteered to help at the Alzheimer’s Association Orange County Chapter’s Annual “Creating Hope” Gala on March 28. 2015. This is Catalina’s second year volunteering for the Alzheimer’s Family Services Center‘s (AFSC) “Gathering of Friends” event. Catalina Elwell is Cerna Orange County’s Care Coordinator and she is all about helping out a worthy cause. The 15th annual event is presented by the Alzheimer’s Family Services Center, a non-profit organization created to improve quality of life for families challenged by Alzheimer’s disease or other dementias. On Thursday night January 22, 2015 Cerna Home Care participated in an event at the Bowers Museum in Santa Ana featuring Dr. Tonia Vojkofsky, Psy.D., founder of Cognitive Care Solutions. The evening was co-sponsored by The James Irvine Foundation and the Alzheimer’s Association of Orange County. Cerna Home Care is proud to announce the establishment of The Cerna Foundation (TCF). The Cerna Foundation is a not for profit organization created to give back to seniors who have given us so much.